Old-time country meets jazz cabaret. With a healthy dose of humour and a vivid imagination, Yukon singer/songwriter Claire Ness has a performance style and energy duly influenced by her background as a clown and vaudevillian, but underneath is an old soul with a deep well of poetry, storytelling, imagery, and metaphor. Claire writes in both English and French, entertaining audiences by unabashedly baring her untamed tales from the far northern frontier. On the Trail (2017) was produced by Juno-Award-winning producer Bob Hamilton and is Claire’s third album. It features a top notch team of Canadian musicians and presents an eclectic collection of Claire’s original songs, steeped in the sounds of jazz, folk, western swing, bluegrass, and country music .The album includes such songs as: ‘The Cave’, a passionate pop-roots love song and ode to cave-dwelling; ‘Ruthie T’, the poignant tale of a country girl who moves to the city; ‘Lucky Shark’, a song about a hungry shark who scrapes by in life but ultimately thrives; ‘Mechanic’, a humorously tongue-in-cheek song about marriage; ‘Dance Me Through Life’, a light-hearted and poetic ballad of romance; and ‘Low Ball Louie’, a fast and catchy number about one of real life’s forgotten people. After studying comedy at Humber College in Toronto, and circus instruction at École Nationale de Cirque in Montréal, Claire founded the Yukon Circus Society in 2011 to produce circus shows and camps. With her portable aerial circus rig, Claire and her team travel to festivals and communities playing music and teaching workshops in trapeze, silks, aerial hoop, juggling, stiltwalking, unicycling etc. 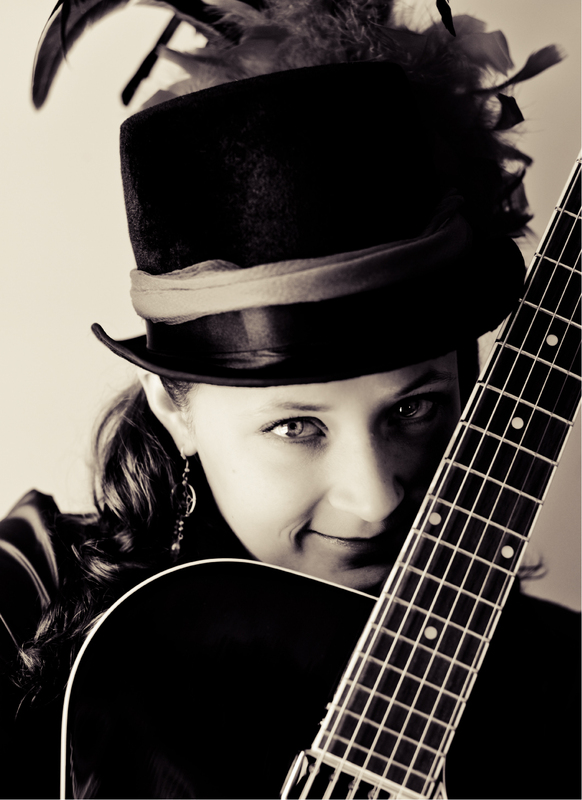 Claire has performed at numerous events and festivals including: Break Out West, Folk on the Rocks, Winnipeg Music Festival, HomeRoutes, Via Rail Artist on Board, Pivot Theatre Festival, Yukon Sourdough Rendezvous Festival, Kluane Mountain Bluegrass Festival and Atlin Arts and Music Festival. Now living part time in her hometown of Whitehorse, Yukon and part time in Caraquet on the Acadian Penninsula in New Brunswick, Claire will have a lot of ground to cover in between, zig-zagging across the country in a 1957 GMC classic school bus. Performing songs from her new album “On The Trail” (March 2017), and from her first two albums (Hopeless Romantic 2013 and Jackfish Girl LIVE 2014) continues to entertain audiences by unabashedly baring her untamed tales from the far northern frontier – odes to 2-cycle engine oil, ballads of bad fishing buddies, uplifting meteorological metaphors, tunes from the trail, and bona fide love songs from a candid heart!